The mission of The Martis Fund is to conserve open space, manage and restore habitat and forest lands, and support workforce housing and related community purposes in the Martis Valley and greater Placer County region. 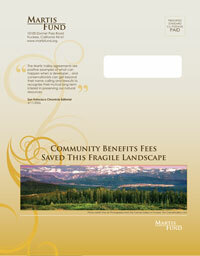 The Martis Fund was created in 2006 by conservationists and landowners committed to the long-term future of Martis Valley. The Fund supports programs to conserve open space; manage and restore habitat and forest lands; and promote opportunities for workforce housing and related community purposes in the Martis Valley Region. We fulfill our mission primarily through grants to qualifying 501 (C) (3) non-profit organizations active in the region. Funding for our grant programs comes from private community benefit fees (transfer fees). The Fund’s primary role is managing and dispersing financial resources raised in connection with real estate sales (transfer fees) at Martis Camp. We connect non-profit organizations to financial resources to complete projects serving our mission. The Martis Fund is a collaborative project of the developers of the Martis Camp community and its members, Mountain Area Preservation (MAP), and Sierra Watch. DMB/Highlands Group, LLC, comprised of two of the country’s premier recreational-residential community developers, DMB Pacific Ventures and Highlands Management Group, is responsible for the creation of Lahonton and Martis Camp in Martis Valley. The partnership is known for its combination of entrepreneurial spirit, environmental stewardship, world class resort communities and financial strength. Mountain Area Preservation engages key stakeholders, decision makers and the public on critical land use decisions affecting the Greater Truckee region of the Sierra Nevada. Founded in 1987, the Truckee-based non-profit is a leader in advancing smart community planning and implementing creative solutions to protect the region’s sensitive mountain landscape. Sierra Watch provides strategic leadership to targeted conservation campaigns, securing permanent protection of threatened Sierra landscapes. Since 2000, the Nevada City-based organization has demonstrated unprecedented success in Martis Valley, on Donner Summit, and beyond.